Global trends effecting entrepreneurship education, making the teaching a more appealing job and how to empower young people and transform their skills into employability are some of the topics covered during the Summit trough panel debates and working groups. Participants also had the opportunity to network and be engaged in workshops where they shared their experience and took part in practical activities. “Hearing the outcomes of this conference makes me optimist. In the Eurydice report we realise that all Member States have arrived to the conclusion that entrepreneurship education is something important, however none could completely solve the problem. 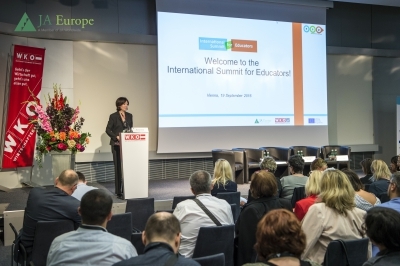 It is vital to make everyone understand that entrepreneurship education is not only related to business but it is about preparing young people for life.” Denis Crowley, Head of Unit - Innovation in Education EIT and MSCA, DG Education, European Commission. Thanks to all the people who participated and contributed to make the event a milestone in the discussion surrounding entrepreneurship education and the key role educators play!